Gwen’s social life is picking up this spring. Last weekend she was a flower girl in the wedding! Gwen’s caregiver Elisabeth was the bride. The colors were black and white with red accents. Elisabeth wanted Gwen in a dress with a black bodice, a white skirt and some red trim somewhere. I went ahead and made a duplicate of last year’s prom dress using silk dupioni in black and white. It was very scary to be sewing that beautiful thin silk, but dupioni is surprisingly strong and nice to sew. Pin marks didn’t show on either color. It is imperative to zigzag or serge ALL raw edges because the stuff ravels. Fluffy black threads are still wafting around my sewing area. For the red trim, I made a ribbon ladybug because Elisabeth’s mother has called her “ladybug” ever since she was a tiny preemie many years ago. 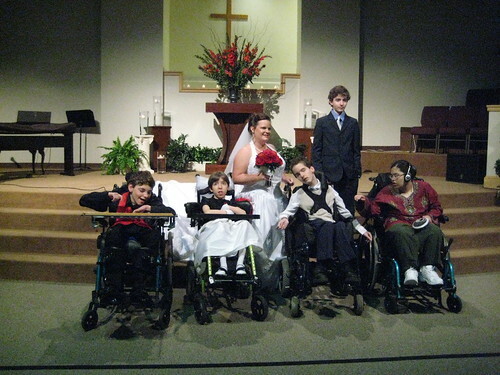 The florist decked out the back of the wheelchair with white tulle, white ribbon and a cluster of red roses. We couldn’t get any smiles out of our usually happy girl. We thought it was because she was tired, but it turned out she was on the verge of being sick with a nasty virus. 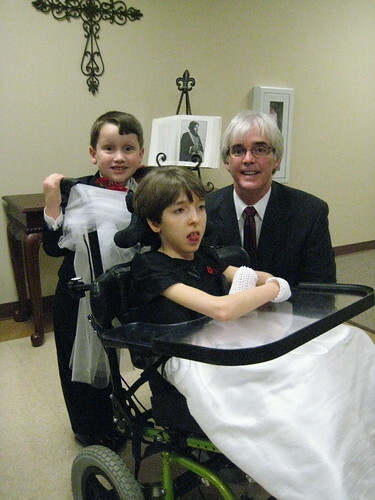 Gwen with her boyfriend Alexander, who served as the ring bearer. Gwen will be attending Alexander’s prom again this spring. She will wear the same dress but we will glam it up a little. 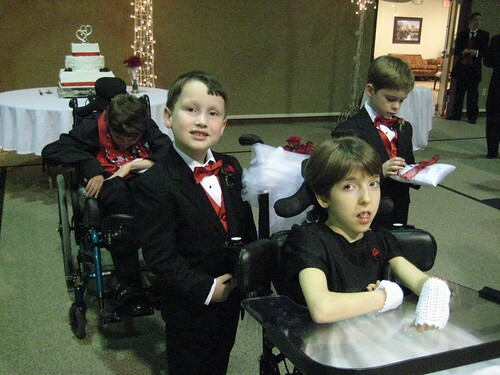 Gwen and Alexander were great attendants. They only made a little noise. Alexander’s mother and I were strategically seated on the front rows in case somebody got a little too rowdy but everyone behaved beautifully. In the lobby after the ceremony. Aren’t Gwen and her daddy just two peas in a pod? Elisabeth has taken care of all of these kids at one time or another. 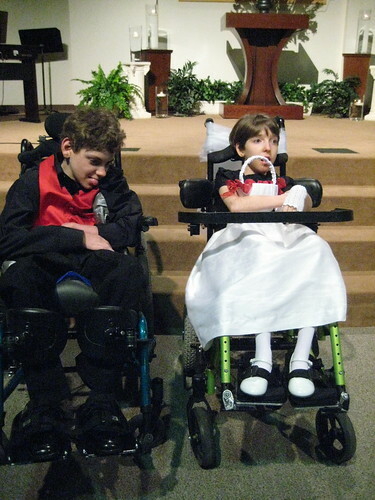 The boy standing up is not handicapped, but is the twin brother of the boy in front of him. We are hoping that the wedding photographer has at least one pic of Gwen with a smile. She did perk up a bit at the reception, because after all it was a party! This made for a tiring weekend but it was a lot of fun. I was a flower girl three times and it was fun to see my sweet baby have the experience too. Even if she had no idea what was going on. This entry was posted on March 19, 2009 at 9:54 pm and is filed under Uncategorized. You can follow any responses to this entry through the RSS 2.0 feed. You can leave a response, or trackback from your own site. She is daddy’s little girl! :) She looked beautiful! Aww, she looks so much like your husband! You did a wonderful job on her dress too, it looks great. I agree, Gwen’s adorable. :) And Elisabeth a true gem, I wish her all the happiness she deserves! 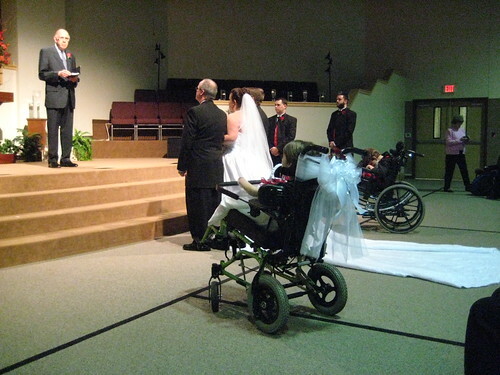 What an amazing ceremony. I bet there were many wet eyes. Great photos! Thanks so much for sharing and I am uber proud of you for going after that dupioni silk, you have wanted it for ages. The dress is a dream. 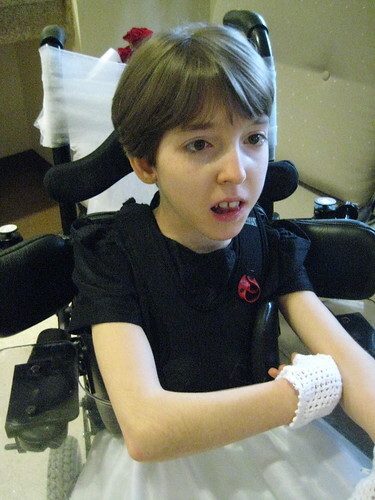 Hope Gwen is able to tackle the virus quickly and doesn’t share it with your or her daddy!